This article is about the legal concept. For the business of selling and leasing real property, see real estate. In English common law, real property, real estate, realty, or immovable property is land which is the property of some person and all structures (also called improvements or fixtures) integrated with or affixed to the land, including crops, buildings, machinery, wells, dams, ponds, mines, canals, and roads, among other things. The term is historic, arising from the now-discontinued form of action, which distinguished between real property disputes and personal property disputes. Personal property was, and continues to be, all property that is not real property. The word "real" derives from Latin res ("thing"), which was used in Middle English to mean "relating to things, especially real property". In common law, real property was property that could be protected by some form of real action,[clarification needed] in contrast to personal property, where a plaintiff would have to resort to another form of action. As a result of this formalist approach, some things the common law deems to be land would not be classified as such by most modern legal systems, for example an advowson (the right to nominate a priest) was real property. By contrast the rights of a leaseholder originate in personal actions and so the common law originally treated a leasehold as part of personal property. The law now broadly distinguishes between real property (land and anything affixed to it) and personal property (everything else, e.g., clothing, furniture, money). The conceptual difference was between immovable property, which would transfer title along with the land, and movable property, which a person would retain title to. In modern legal systems derived from English common law, classification of property as real or personal may vary somewhat according to jurisdiction or, even within jurisdictions, according to purpose, as in defining whether and how the property may be taxed. Bethell (1998) contains much historical information on the historical evolution of real property and property rights. To be of any value a claim to any property must be accompanied by a verifiable and legal property description. Such a description usually makes use of natural or manmade boundaries such as seacoasts, rivers, streams, the crests of ridges, lakeshores, highways, roads, and railroad tracks or purpose-built markers such as cairns, surveyor's posts, fences, official government surveying marks (such as ones affixed by the National Geodetic Survey), and so forth. In many cases, a description refers to one or more lots on a plat, a map of property boundaries kept in public records. The law recognizes different sorts of interests, called estates, in real property. The type of estate is generally determined by the language of the deed, lease, bill of sale, will, land grant, etc., through which the estate was acquired. Estates are distinguished by the varying property rights that vest in each, and that determine the duration and transferability of the various estates. A party enjoying an estate is called a "tenant". Fee simple: An estate of indefinite duration, that can be freely transferred. The most common and perhaps most absolute type of estate, under which the tenant enjoys the greatest discretion over the disposal of the property. Conditional Fee simple: An estate lasting forever as long as one or more conditions stipulated by the deed's grantor does not occur. If such a condition does occur, the property reverts to the grantor, or a remainder interest is passed on to a third party. Fee tail: An estate which, upon the death of the tenant, is transferred to his or her heirs. Life estate: An estate lasting for the natural life of the grantee, called a "life tenant". If a life estate can be sold, a sale does not change its duration, which is limited by the natural life of the original grantee. A life estate pur autre vie is held by one person for the natural life of another person. Such an estate may arise if the original life tenant sells her life estate to another, or if the life estate is originally granted pur autre vie. 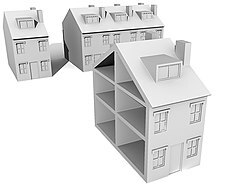 Leasehold: An estate of limited term, as set out in a contract, called a lease, between the party granted the leasehold, called the lessee, and another party, called the lessor, having a longer estate in the property. For example, an apartment-dweller with a one-year lease has a leasehold estate in her apartment. Lessees typically agree to pay a stated rent to the lessor. Though a leasehold relates to real property, the leasehold interest is historically classified as personal property. Reversion: A reversion arises when a tenant grants an estate of lesser maximum term than his own. Ownership of the land returns to the original tenant when the grantee's estate expires. The original tenant's future interest is a reversion. Remainder: A remainder arises when a tenant with a fee simple grants someone a life estate or conditional fee simple, and specifies a third party to whom the land goes when the life estate ends or the condition occurs. The third party is said to have a remainder. The third party may have a legal right to limit the life tenant's use of the land. Estates may be held jointly as joint tenants with rights of survivorship or as tenants in common. The difference in these two types of joint ownership of an estate in land is basically the inheritability of the estate and the shares of interest that each tenant owns. In a joint tenancy with rights of survivorship deed, or JTWROS, the death of one tenant means that the surviving tenants become the sole owners of the estate. Nothing passes to the heirs of the deceased tenant. In some jurisdictions, the specific words "with right of survivorship" must be used, or the tenancy will assumed to be tenants in common without rights of survivorship. The co-owners always take a JTWROS deed in equal shares, so each tenant must own an equal share of the property regardless of any contribution to purchase price. If the property is someday sold or subdivided, the proceeds must be distributed equally with no credits given for any excess than any one co-owner may have contributed to purchase the property. The death of a co-owner of a tenants in common (TIC) deed will have a heritable portion of the estate in proportion to his ownership interest which is presumed to be equal among all tenants unless otherwise stated in the transfer deed. However, if TIC property is sold or subdivided, in some States, Provinces, etc., a credit can be automatically made for unequal contributions to the purchase price (unlike a partition of a JTWROS deed). Real property may be owned jointly with several tenants, through devices such as the condominium, housing cooperative, and building cooperative. Real property is unique because there are multiple rights associated with each piece of property. For example, most U.S. jurisdictions recognized the following rights: right to sell; right to lease; right to acquire minerals, gas, oil, etc. within the land; right to use; right to possess; right to develop; etc. These multiple rights are important because owners of the real property can generally do what they choose with each right. For example, the owner could choose to keep all the rights but lease the right to drill for oil to an oil company, or the owner could choose to keep all the rights but lease the property to a tenant. In other words, the owner can elect to keep, lease or sell the rights to the land. Allodial title: Real property that is independent of any superior landlord. Allodium is "Land held absolutely in one's own right, and not of any lord or superior; land not subject to feudal duties or burdens. An estate held by absolute ownership, without recognizing any superior to whom any duty is due on account thereof." In the law of almost every country, the state is the ultimate owner of all land under its jurisdiction, because it is the sovereign, or supreme lawmaking authority. Physical and corporate persons do not have allodial title; they do not own land but only enjoy estates in the land, also known as "equitable interests". In many countries the Torrens title system of real estate ownership is managed and guaranteed by the government and replaces cumbersome tracing of ownership. The Torrens title system operates on the principle of "title by registration" (i.e. the indefeasibility of a registered interest) rather than "registration of title". The system does away with the need for a chain of title (i.e. tracing title through a series of documents) and does away with the conveyancing costs of such searches. The State guarantees title and is usually supported by a compensation scheme for those who lose their title due to the State's operation. It has been in practice in all Australian states and in New Zealand since between 1858 and 1875, has more recently been extended to strata title, and has been adopted by many states, provinces and countries, and in modified form in 9 states of the USA. In the United Kingdom, The Crown is held to be the ultimate owner of all real property in the realm. This fact is material when, for example, property has been disclaimed by its erstwhile owner, in which case the law of escheat applies. In some other jurisdictions (not including the United States), real property is held absolutely. English law has retained the common law distinction between real property and personal property, whereas the civil law distinguishes between "movable" and "immovable" property. In English law, real property is not confined to the ownership of property and the buildings sited thereon – often referred to as "land". Real property also includes many legal relationships between individuals or owners of land that are purely conceptual. One such relationship is the easement, where the owner of one property has the right to pass over a neighbouring property. Another is the various "incorporeal hereditaments", such as profits-à-prendre, where an individual may have the right to take crops from land that is part of another's estate. English law retains a number of forms of property which are largely unknown in other common law jurisdictions such as the advowson, chancel repair liability and lordships of the manor. These are all classified as real property, as they would have been protected by real actions in the early common law. Each U.S. State except Louisiana has its own laws governing real property and the estates therein, grounded in the common law. In Arizona, real property is generally defined as land and the things permanently attached to the land. Things that are permanently attached to the land, which also can be referred to as improvements, include homes, garages, and buildings. Manufactured homes can obtain an affidavit of affixture. Land use, land valuation, and the determination of the incomes of landowners, are among the oldest questions in economic theory. Land is an essential input (factor of production) for agriculture, and agriculture is by far the most important economic activity in pre-industrial societies. With the advent of industrialization, important new uses for land emerge, as sites for factories, warehouses, offices, and urban agglomerations. Also, the value of real property taking the form of man-made structures and machinery increases relative to the value of land alone. The concept of real property eventually comes to encompass effectively all forms of tangible fixed capital. with the rise of extractive industries, real property comes to encompass natural capital. With the rise of tourism and leisure, real property comes to include scenic and other amenity values. Nature and consequences of transaction costs when changing and transferring estates. For an introduction to the economic analysis of property law, see Shavell (2004), and Cooter and Ulen (2003). For a collection of related scholarly articles, see Epstein (2007). Ellickson (1993) broadens the economic analysis of real property with a variety of facts drawn from history and ethnography. ^ Concise Oxford English Dictionary, Tenth Edition,1999,p 1192. ^ Black's Law Dictionary - 2nd Edition. Stoebuck, W. B., and Dale A. Whitman, 2000. The Law of Property, 3rd. ed. St. Paul MN: West Group Publishing. Thomas, David A., ed., 1996. Thompson on Real Property. Charlottesville VA: Michie Co.
Ackerman, B., R. Ellickson, and C.M. Rose, 2002. Perspectives on Property Law, 3rd ed. Aspen Law and Business. Tom Bethell, 1998. Noblest Triumph: Property and Prosperity through the Ages. St Martin's Press. For lay people. Robert Cooter, and Thomas Ulen, 2003. Law and Economics, 4th. ed. Addison-Wesley. Chpts. 4,5. Easier text. Ellickson, Robert, 1993, "Property in Land," Yale Law Journal 102: 1315-1400. Richard Epstein, ed., 2007, Economics of Property Law. Edward Elgar. An anthology of articles, mostly from the law literature. Shavell, Steven, 2004. Foundations of Economic Analysis of Law. Harvard Univ. Press. Chpts. 2-5. Harder text; extensive references. Jeremy Waldron, 1988. The Right to Private Property. Oxford Univ. Press. Oswaldo D. Agcaoili, ISBN 971-23-4501-7, ed. 2006, Property Registration Code. Agcaoili. Land Titles and Deeds: Property Law and Cases in the Philippines.